The FTSE 100 outperformed mid-caps last tax year, but the top FTSE 350 performers might surprise you. Take a look at the financial year ended on the 5th April, with the 25 top performing stocks in the FTSE 350 all producing gains of 40 per cent or more over the 12-month period. Anyone waiting until later in the year to utilise their ISA allowance will have missed out on these rewards. What's also interesting about our list of tax year 2018-19 top performers is how it pays to look further afield, given that only six blue-chip stocks feature in the top 25. Among the six, Ocado (LSE:OCDO) joined the top flight last May and has continued to set a blistering pace after some high-profile technology deals with international retail giants. The grocery delivery business is a whisker away from being valued at £10 billion - three years after being the most shorted stock on the market with 20 per cent of its shares out on loan. No FTSE 350 stock comes close to matching Ocado's stunning 165 per cent growth in the tax year, with Micro Focus International (LSE:MCRO) next on the list with a gain of 78 per cent. The software business is back in favour after being one of the five biggest top flight fallers in the previous tax year. It had previously surrendered more than half its value following the troubled integration of assets it acquired from Hewlett-Packard Enterprise in a transformational £6.6 billion deal. Auto Trader (LSE:AUTO) is another FTSE 100 newcomer in the fast lane after shares in the online vehicle marketplace raced ahead 52 per cent in the tax year. While the new car market is suffering from Brexit uncertainty, it appears that the Auto Trader is well placed in the second-hand market as more motor advertising switches from print to online. The company has pledged to return around one third of net income to shareholders in dividends, with surplus cash used to continue its share buy-back programme and to cut debt. A number of other consumer-focused stocks performed surprisingly well in the tax year, including Dunelm (LSE:DNLM) after a 63 per cent rise. As we reported yesterday, the homewares retailer is firing on all cylinders thanks to an updated strategy focusing on in-store technology and additional marketing. Investors are also excited by the promise of a new technology platform, which should offer click and collect services for the first time later this year. One analyst described this week's third quarter trading update as "incredible" after like-for-like store sales at Dunelm grew 9.8 per cent. It's a similar story at Greggs (LSE:GRG), where the launch of a new vegan sausage roll has helped to make it a star stock. While the baker struggled in the early part of the financial year, interim results in July triggered a buying frenzy that continued well beyond Christmas as Greggs produced one of the best performances of all leading stocks in the first quarter of 2019. As well as the 48 per cent rise in Greggs share price, investors piled into Marshalls (LSE:MSLH), Homeserve (LSE:HSV) and interactive investor Winter Portfolio stock JD Sports Fashion (LSE:JD.) in the year. 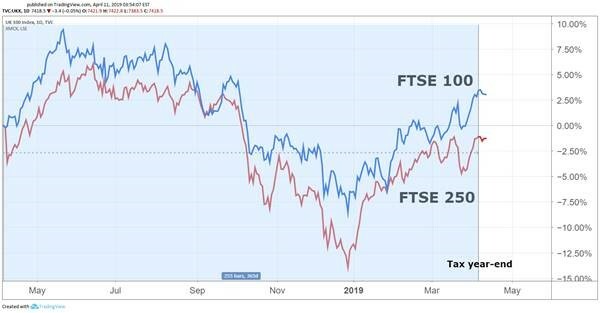 Their gains of more than 40 per cent comfortably eclipse the 3 per cent rise achieved by the FTSE 100 index and the broadly flat performance from the FTSE 250 Index over the tax year. Among those stocks dragging on the FTSE 350, only two came from the top flight. TUI (LSE:TUI)was 53 per cent lower and easyJet (LSE:EZJ) dropped 35 per cent as the pair issued profit warnings in relation to the uncertain outlook for the summer holiday market. Metro Bank (LSE:MTRO) was the biggest faller in the FTSE 350 after it became the target of short-sellers following an accounting blunder in which it miscalculated the amount of capital it needed to support commercial lending. Shares in the challenger bank dived 76 per cent. Next on the list was Indivior (LSE:INDV) after a US court paved the way for rivals to start selling generic versions of its Suboxone film treatment for opioid addiction. The Slough-based firm warned that this could mean an 80% loss of market share for the product within months. If things weren't bad enough for investors after a 75 per cent fall for the former Reckitt Benckiser (LSE:RB.) division in the tax year, the shares slid another 72 per cent when the US Department of Justice accused the company of fraudulent marketing. Shares are currently trading at less than 30p, compared with almost 500p in June last year. Among popular or widely-held stocks to disappoint, Royal Mail (LSE:RMG) fell 53.9 per cent, William Hill (LSE:WMH) dived 50 per cent and Saga (LSE:SAGA) lost 41 per cent of its value after a profits warning towards the end of the financial year.